Having loved cycling since childhood, Justin Kendell was devastated when he found himself unable to ride due to symptoms of MS.
Now he is back on his bike and planning a ride of over 1,300 miles to raise funds for the MS Trust. He is also looking for people to meet up with him and his fellow cyclists along the way to join their incredible journey to the Pyrenees. Hi, my name is Justin, I'm 45 years old and I live with secondary progressive MS. This summer, starting on 2 July, I am going to ride my bike from the PYG, the famous Pen-y-Gwryd hotel at the foot of Snowden, to the Port de Pailhers which is a 2,000 metre high mountain pass in the French Pyrenees. It’s a trip of about 2,200km. Joining me will be my good friend Martin Hill and my 18 year old daughter, Sioned. We are going to do it in 22 stages over 5 weeks. I love bikes, always have. I can remember learning to ride. I must have been about four and my parents had just bought me an old kids’ bike with no stabilisers from 'the sales'. It was a heavy lump of a thing that took my dad a few hours to get functional, unearthing it from under layers of rust. It was a deep burgundy colour. I can remember watching over his shoulder, nagging him, 'Is it ready? Can I ride it now?' That first sunny afternoon on the front lawn I can only really remember my face hitting the grass, the smell of the earth, the intensity of the green. Then later, sitting in the living room, I remember feeling deeply upset that I had failed to ride it. The next morning I got back on and rode it on my first try. I've been riding and falling off ever since! As a kid I had two bikes: a green racer from Halfords that I was ridiculously proud of and a cheap, nasty BMX that was brill. I used to hammer the BMX around the garden, down steps, and over dodgy self-built jumps or up into the miles of forestry roads that cover the hills around Betws-y-Coed where I grew up. Then I’d charge back down as fast as I could make it go. The racer gave me my freedom: miles and more miles around North Wales, or just the couple of miles to the village where my mates lived. Then a mountain bike hire shop opened in Betws, my mum hired me one for an afternoon and I was hooked. I soon became the owner of the best bike in the world, it was an ex-hire Marin Palisades for those in the know. I rode that bike for about five years before I sold it for what we'd paid for it and I've regretted selling it ever since. I just love mountain bikes. In North Wales the scope is endless and rather than cycling on the road with traffic buzzing around your ears, you can lose yourself to the hills, mountains and valleys, following the tracks and paths in the company of trees, birds, butterflies and rain. The best bit about mountain biking is that wet, muddy, slippy conditions are just the most fun and also when you learn the most. Which is a good thing considering how famous Wales is for its rain! After my lovely daughters Sioned and Tesni were born, the amazing Rhian (my wife), the girls, the dogs and I moved to France, bought a wreck of a house and my cycling evolved. 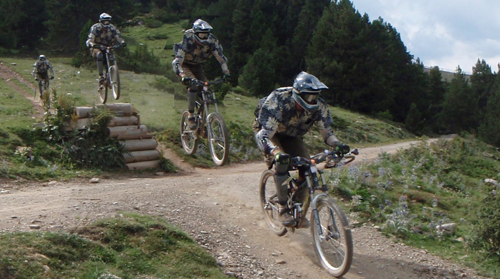 I still did lots of normal mountain biking, but I got properly into downhill, playing at ski resorts in the summer. I’d use the lifts to get up and ride a big, long travel suspension bike down as hard as I dared. Brilliant. In August 2011, the inevitable happened. I was riding in the Alps with my long time, slightly crazy mate Leo, chasing him down a track. There was a little wooden jump over an electric fence, one of the smaller jumps we'd hit over a wonderful fortnight of madness. I was following Leo and as we turned right on to the wooden take-off ramp, a small pebble dislodged by Leo's tyre followed him on to the ramp. I hit the pebble, came off the jump and I ended up sitting (quite comfortably) on a grassy bank with a broken leg. The broken leg turned out to be a tibial plateau fracture (a break in the lower part of the knee) and I was operated on the next day. After many months of physio and hard work I was walking and riding again. At the beginning of 2013 I lost the ability to see. My eyes were fine, but I just couldn't control them. They wandered around at random and I started the journey to diagnosis, followed by the much harder (and ongoing) journey to getting my head around having MS. In retrospect I've lived with MS for years. I was 18 the first time I remember suffering a symptom that I would now say was clearly my MS. I was running the Chester Half Marathon and my urinary system was being rather uncooperative. I have a long list of symptoms that I have suffered over the years that now make sense, but at the time I always brushed them off because they were so varied, and anyway, what is normal? Fatigued? Well just train harder. Clumsy? Well just concentrate on what you're doing. Find it hard to understand what you're seeing? Focus harder. Depressed? Pull yourself together! By the summer of 2014 I had given up riding, I just couldn't see when getting shaken around. I felt that I had lost a big part of myself along with it. Sioned gave me a kick, a big one, “Come on Dad, let's go for a ride!” I was full of doubt but she pushed, “Dad! Just to Buzzard Rock, you know you can do it. Come on, do it for me!” I relented and I got my life back. It was wonderful! I could ride where I couldn't walk. The trees, the birds and the butterflies were still there, and my balance. Oh to be able to move and not feel sick or as though I was about to fall over; to be able to do something and exercise again. Wow! I'm still limited, there is a level of vibration above which I can no longer make sense of my surroundings, so downhill is out of the question. I can still get down most stuff, just not fast. I also struggle to time moves so jumps are tricky to say the least, but it feels oh so good to be in balance and to be, from time to time, reasonably normal. I have rediscovered the joy of the road and just love the level of workout that I can get. I can push to a point where I am pretty much completely paralysed from the waist down by the time I get off the bike, which can be quite startling for bystanders! The road also gives me new opportunities for understanding myself and my symptoms, and finding ways to live with them more easily. Just yesterday I learned something new. I was cycling the long way to my weekly physio appointment (about 50km) and halfway up the second major climb I started to struggle with something that has bothered me on and off for years. My legs just stop working, muscles screaming, when I know they should be OK. My heart rate returns to near normal and I have to slow right down and just stop. Yesterday I realised that I wasn't really out of breath, so I consciously started breathing deep and hard, focussing on the birds singing in the background. I was breathing deep and rhythmically, keeping my legs turning in time with my breathing (especially my right leg which is difficult to feel and control) and it was fine. My legs just kept going and instead of collapsing half way up, I rode the hill with (for me) power and poise. It was so exhilarating! I've been looking for something to get my teeth into for a while; something extraordinary to challenge myself with. Something tough, but that I believe that I can achieve. Something that I can feel pride in myself for accomplishing. 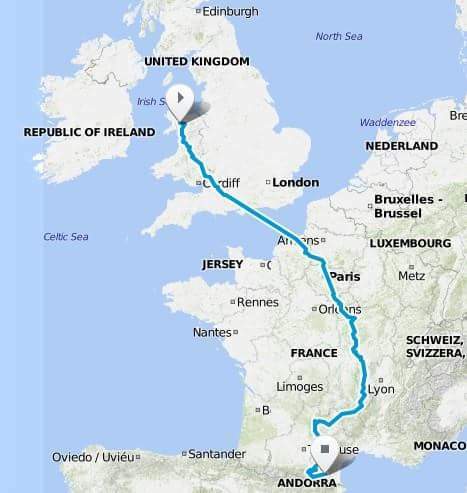 When Martin suggested a ride from London to Southern France I didn't hesitate in agreeing and the route quickly grew to include a few more hills! There was no way Sioned was going to let us leave her behind, so the core team of three was set. I love having a reason to get up in the morning, a reason to keep training when my illness wants me to stop, a raison d'etre. To all of us it seemed a great chance to help the MS Trust in its wonderful work, and local groups here in France, but to me the coolest thing is to try to inspire people. Please come and join us on the ride for a week, a day or just a couple of km. You can contact us via our Facebook page or contact Rebekah at the MS Trust on fundraising@mstrust.org.uk.